Tomorrow I am leaving for Italy… my dream destination. I have always wanted to visit Italy because from what I have read , pictures I have seen and the food, makes Italy seem like a romantic country. Wine, pasta, pizza, caprese salad, gelato, limoncello…. seriously how can one leave that country hungry? Churches, piazzas, gondolas, beautiful beaches, scenic countryside what more is required to feel romantic? Before hubby and I get into that holiday mood and behave like typical tourists, clicking umpteen photos and trying to see every thing and anything, we have to pack, catch a flight, close the house, etc etc. So many minor details to take care of before we can go on a holiday. Have you noticed how stressful it has become to actually go on a holiday? Visas, millions of forms to fill, measure the exact dimension of your suitcase, make sure the weight of the luggage is not even 100g over the specified allowance, meander through slow moving traffic to get to the airport, face unfriendly airline staff, go through grueling security procedures and then dwindle your thumbs till the gates open. Once on the flight, fight for space to fit your hand luggage in the ever decreasing overhead bins, jostle with your neighbour for the arm rest, pretend you love the hot meal served, fiddle with the buttons to get the right movie, sound and clarity. Falling asleep is usually a losing battle as you may have to listen to someone having a conversation even when the lights are dimmed, or some hyper passengers wanting to walk up and down the aisle, hitting your arm or head every time they pass by you. Once the plane lands, everyone is in a hurry to get their hand luggage, get off the plane and fight for space on the escalators once we approach the terminal. Long queues to use the wash rooms, face stern looking immigration officers and then waiting at the correct carousel hoping you bags are not left at the embarkment point. Though by then the excitement builds up to be in a new place, a new country, we still have to face callous taxi drivers, waiting to fleece the first gullible tourist they set their eyes on. Be assured you will not be able to evade their vision tunnel. The long drive to your hotel, check in delays and then the holiday finally begins. Coming to the recipe, I use to make these cookies very often when the kids and my in laws were living here. The cookies are really crunchy because of the cereals. Haven’t made these for a very long time, but decided to make them as a treat for my best friend’s son and his new bride who are visiting Mombasa for 2 weeks. Hope they enjoy the crunchy cookies and you will try this recipe out. Grease baking trays lightly with butter. Mix weetabix, cornflakes, coconut, rice crispies, nuts, raisins and oats in a bowl. In another bowl sift the flours, baking powder and soda bicarbonate. Cream sugar and butter till it is pale in colour, soft and creamy. Add milk and vanilla extract. Whisk till all the milk is mixed into the butter sugar mixture. Add the cereal mixture and mix. Take about a tablespoonful of the dough. Roll it into a ball. Flatten it slightly and place on the tray. Repeat steps 9 and 10 with the remaining dough. Place the slightly flattened balls about an inch apart. Bake in the oven for 12 to 15 minutes or until the cookies appear light brown. Place the cookies on a wire rack to cool. Add other dried fruits instead of raisins. Use cereals of your preference. Use orange, lemon extract instead of vanilla. If the dough is too soft, put it in the fridge for 20 minutes. Those cookies are just torturing me, so tempting and droolworthy. 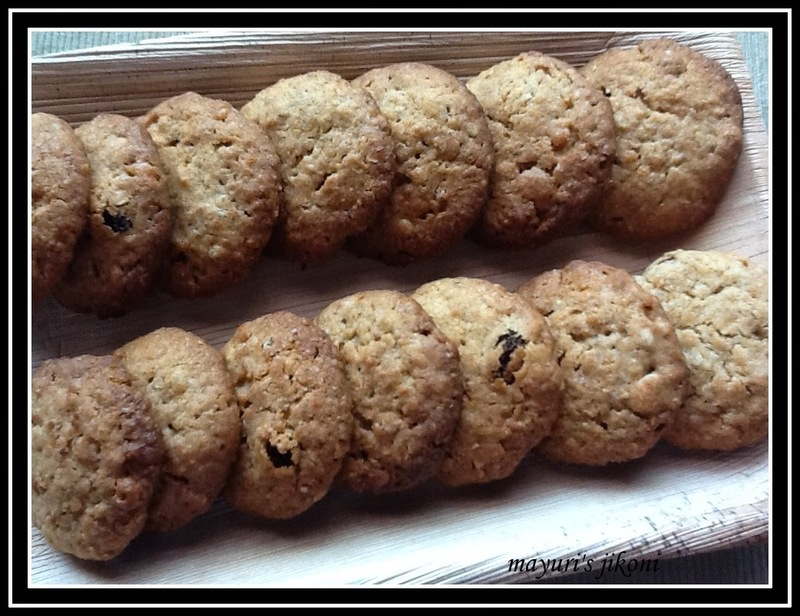 love this healthy , crunchy cookies, love to dip it in tea and savor it. Wow… that is so sweet of him! I'm sure you will have a fabulous time and just make sure you photograph everything you are eating 🙂 Be safe and have a blast. Have a fun vacation…..I'm sure Italy will be everything you imagined it to be and then some more!